Like dogs, cats do face stress and anxiety. Sometimes, it becomes difficult for pet parents to recognize whether their kitty is undergoing stress or not. Most cats face stress due to number of situations ranging from physical pain, medical treatment to some unwanted environment created in the house. Let us first find the different reasons that cause stress in cats. Addition of a new animal member in the family eg: dog or a cat. All these are the sources that mostly cause stress in your feline friend. In order to combat this condition, you need to know what are different symptoms or signs that can help you identify behavioral problem in your furry pet. Deeply understand and try to look for these signs in your lovable feline companion. Changes in grooming habits such as your cat may wash until bare spots appear or will not bathe at all. Changes in eating habits or eating inedible things like plastic bowl, dishtowels or carpet. Finding few of these symptoms in your pet, you need to take proper cat care steps to help reduce stress in your pretty kitty. 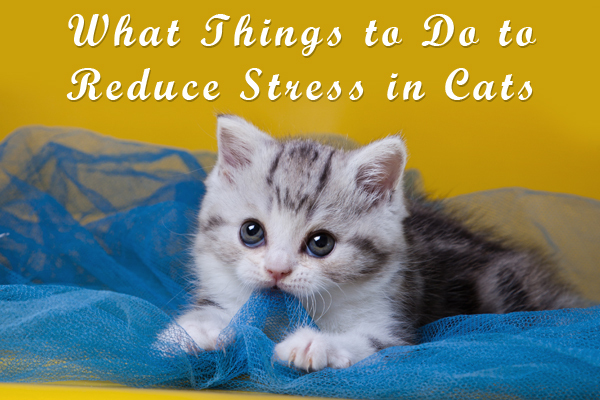 Check the following tips that will certainly help you to de-stress your anxious cat. You need first to find whether there is any physical condition or not your cat is suffering from. If her claws are grown painfully long, trim them. Make sure that you provide plenty of food and water to your cat. This will help your cat from experiencing long bouts of hunger or thirst. Treat your cat for flea and tick infestation. Additionally, provide deworming treatment. Cat toys are available in the market or there may be some in your house. Provide these toys to your cat. Collect a wide range of cat toys but only put a few within reach of your furry pal. Every couple of days, take the toys you have given and replace them with the new ones. Make it a point to play with your cat. Either dangle something interesting for her to jump and reach or throw some things across the room for her to bring back. Every cat owner should know that having a perch for a cat is a necessity that every cat would love to possess and sit on it to see the things outside. This is very much helpful for lowering stress. There are certain things that you need to change in your house to make it cat friendly. Don’t keep the music on high volume. Cats have too sensitive ears. Loud noise can harm her ears and irritate them. Reduce the volume of loud music player, television or other source of noise. Take care that you don’t yell at your cat. Cats are not humans who can understand the connection between hitting or yelling, which you may be doing to correct her from doing wrong. Don’t train them by shouting or yelling. This only makes them more anxious and fearful. In time of danger or anxiety, cats try to avoid humans and dogs. At such times, they try to jump on the shelf or some high location place. It is beneficial if you provide or make a cat tree for your pet. Having cat condominium, your kitty will remain calm and stress free watching her prey or enemies from a distant. It may seem like stupid or foolish, but playing slow songs or singing a lullaby definitely helps to lower the amount of anxiety making your furry pal feel mentally relax. As the music is effective in soothing the human minds, it has the same effect on cats. It cools down your furry pal, make her comfortable and calm down her freak-outs. Trying all the things, if you still find that your furry kitty is still undergoing stressful conditions, a vet visit can help her. Your veterinarian can diagnose for any possible health issue your pet is experiencing, or he will try to find the reason that is disturbing her. Your vet may prescribe some anti-anxiety medicine or over-the-counter medications that can help reduce anxiety or stress in her.